Mitch Evans became Jaguar Racing’s first e-Prix winner and the seventh of the season following a titanic battle with Andre Lotterer around the streets of Rome. With the race starting in wet but drying conditions, the circuit was too slippery for some to handle and when Jose Maria Lopez hit the kerb on the exit wall of Turn 18, it created a traffic jam of cars behind him that brought about a red flag. 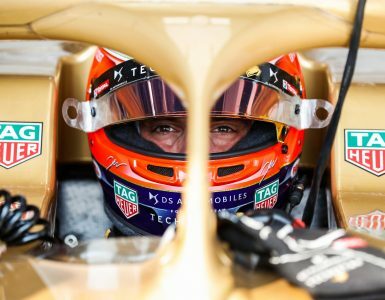 Following a delay of almost an hour, racing resumed, and it was Evans who eventually kept his nerve to lead home DS TECHEETAH’s Lotterer and Stoffel Vandoorne with only 2% of battery power remaining. A testament to the growing popularity of Formula E, Ewan McGregor, Sir Chris Hoy and even Formula One pundit and Evans’ manager Mark Webber were on the grid to support the race. And when the action did get underway, it certainly didn’t disappoint. 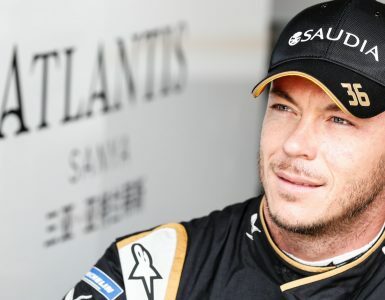 Having become the seventh different pole sitter of this remarkable season, Lotterer led away Evans and the usually fast-starting Vandoorne and Sebastian Buemi as chaos ensued behind on a wet but drying surface. A spinning Maximillian Guenther sprayed bodywork onto the track before the unfortunate Sam Bird was punted into the barrier by an ambitious Jose Maria Lopez to bring about a yellow flag. That yellow quickly turned to red as Lopez made a second error, hitting the kerb on the exit wall of Turn 18, creating a car park involving the unfortunate Gary Paffett, Jean-Eric Vergne and a host of other drivers. When racing did eventually resume, Lotterer once again led the field away and, as has often been the case, the majority of the field behind the front runners took the opportune moment to activate Attack Mode as the safety car peeled off. But on the notoriously narrow Rome track, overtaking opportunities remained few and far between as Attack Mode dwindled and disappeared with few changes of position. It didn’t detract from the action, Mortara making a great move stick on teammate Massa before both Venturis astonishingly ground to a halt a few laps later. It brought out another full course yellow flag to clear the Brazilian’s car. Back at the business end of things, Evans was putting Lotterer under serious pressure, as had Bird in Hong Kong. Engaging Attack Mode, Evans set about the leader, getting on the throttle early to pull off a brilliant pass and take the lead in the bus stop chicane following a titanic battle. Next, it was Evans’ turn to become the hunted as Lotterer engaged his Attack Mode. And when the New Zealander missed his Attack Mode zone, Lotterer was all over the back of him. But just as Lotterer had failed to defend, so Evans succeeded, hanging on to win with from the DS TECHEETAH and Vandoorne’s HWA with his battery power almost out. Robin Frijns was fourth from Buemi, Rowland and di Grassi with d’Ambrosio, da Costa and Wehrlein rounding off the points scoring finishers. After what happened to Lotterer in Hong Kong, when he was punted out of the lead by Bird on the penultimate lap, he may well now be tempted to utter the words of Maximus Decimus Meridius of Gladiator movie fame, “I will have my vengeance”. Instead, he was magnanimous in defeat and surely his time will come, possibly as the eighth different winner in as many races. What a race! @Andre_Lotterer crosses the line in P2 💪. 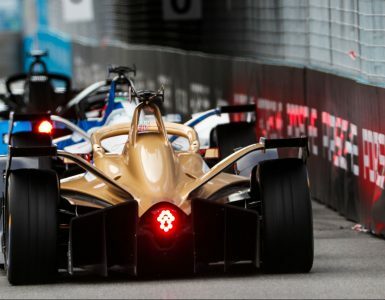 Teammate and Sanya winner Vergne looked set for seventh place but a late time penalty for passing under yellow flag conditions dropped him to 14th behind the NIO of Oliver Turvey. The latest results means that d’Ambrosio leads the standings on 65 points, one clear of da Costa with Lotterer jumping to third on 62, just one clear of Evans. Incredibly, only 13 points separate the top nine drivers in this most crazy of seasons. What on earth will happen next? There’s only two weeks to find out when Formula E heads to Paris for the second leg of the European season.